City Water, and other treated water, is frequently processed using Fluoride. Customers wishing to reduce Fluoride in their drinking water can incorporate the optional Fluoride Reduction Elements into their Berkey Purification System. The PF-2 Element is threaded onto the Berkey® Black Purification Elements. Reduces the amount of fluoride in your water by up to 95%. Replacement is recommended for a set of two Berkey PF-2 elements after 1,000 gallons (3,785 liters). Water source Fluoride and Arsenic levels vary significantly in treatment plants. 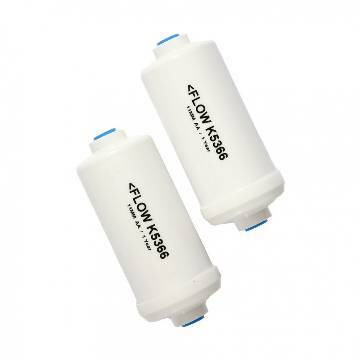 Actual PF-2 filter capacity depends on water consumption and the presence of other competing contaminants. High levels of arsenic, fluoride and certain heavy metals may negatively affect the efficiency and capacity of the PF-2 elements requiring more frequent replacement. Testing was performed with a flow rate of less than 3 Gallons per minute (11 liters) per cu.ft. of the Berkey filtering medium at 20 - 30 parts per million (ppm) of the ion in the solution liquid. Results of < 1ppm of the Fluoride ion in the effluent were typical for the filter media (>95% reduction). Under optimum laboratory conditions, effluent concentrations of less than 50 part per billion (ppb) were readily achieved which equates to a >99.75% reduction. ARSENIC: Arsenic cation and arsenic oxide anions have unique properties that this Berkey filter product effectively targets.